Our sterling silver medium round charm is custom engraved with your loved one's actual handprint and footprint images for a truly one of a kind personalized keepsake. 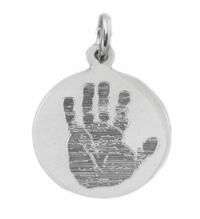 This round charm can hold either 1 handprint; 1 footprint; 2 footprints; 1 hand with 1 Foot. Select image type in the drop down box below. The image is diamond engraved into a round sterling silver charm, 18mm diameter. You can put this charm onto a bracelet, chain selections are below. The BACK of the charm can be engraved with your child's names, dates or a special saying. The first line of personalization is included in the price. Fill out the text box below with the desired inscription. You can email or snail mail your handprint and footprint images to us separately after placing your order. Please be sure to reference your order number if sending separately. The best quality image reproduction is from dark, high contrast ink prints against a white paper background. If you are going to create new handprint or footprint images, you can use black washable ink and plain white cardstock (without any decorative textures or backgrounds). These can usually be found at your local crafts store. We also sell a no-mess, no-fuss Inkless Wipe Kit with specially coated paper that you can create your own prints with. Most of our customers use the footprints or handprints made by the hospital from when the child is born. It is OK if there are smudges or writing through the prints, we can edit this out. We realize that you may only have one set of prints, especially if using the prints of a baby, child, or loved one that has passed away. We will do the best we can with what you send us, and treat your prints with the utmost respect that they deserve in such a delicate situation. No original copies will be harmed in the making of your custom piece, as we ask for scanned copies or photocopies of the prints. It is OK to have the prints on more than one piece of paper. Just send us an email with each scan attached and specify your instructions in the email. We'll take care of the rest! Scan the prints as a color photograph (not as a document) at 300 or 600 dpi. Save as a .jpg format. Please note that cell phone and digital camera photographs of the prints do not render the best starting quality. We recommend that you use a flat bed scanner to capture the ink prints. If you do not have access to a scanner, then please mail us a very good photocopy of the prints (do not send originals) and we will scan the prints in our studio for the best quality finished piece. If the hand or footprints are not on a flat medium (3D mold, in a frame, or on a plate, ball, plaque, or other decorative item) and you must use a photograph to capture the prints, please use a quality digital camera with the Macro mode on, and use a medium image size setting. Be aware of the lighting and try to not have shadows through the prints or skewed angles of the prints. If you are unsure whether your prints will be good for an engraving, please email us your prints before placing an order and we can let you know, or offer more tips for the best image rendering. We will edit the handprints and footprints to remove any smudges, darken the ink, and highlight some details. If the ink prints did not capture the feet or hands completely, we are able to add or fill in toes and fingers, or round out heels and palms. Let us know in the Special Instructions box if you want any revisions to the prints. Alternatively, please let us know it there are extra digits or other features that should be kept in the print. Every person is special and unique! The prints will be reduced in size and arranged in a layout that best fits the piece you have chosen. We personally engrave these custom handprint and footprint jewelry pieces in our studio using our own unique process of diamond engraving fine horizontal lines deeply into the piece for durability and incredible detail that will comfort you to wear a true representation made by your loved one. These jewelry pieces are not oxidized or supplementally darkened. The engraved image will shimmer from white to dark grey depending on the angle of light it is viewed in. The engraved image will slightly darken over time due to natural oxidation. Please allow 2-3 weeks for your custom charm to be made. Holidays such as Christmas, Mother's Day and Father's Day have specific cut off dates to order by, to ensure the proper time required for processing and shipping. Please see our Holiday Ordering Dates page before placing your order.